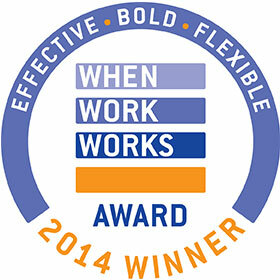 GiftCard Partners has been honored with the 2014 When Work Works Award for its use of exemplary workplace practice to increase business and employee success. This prestigious award, part of the national When Work Works project administered by the Families and Work Institute (FWI) and the Society for Human Resource Management (SHRM), recognizes employers of all sizes and types in the state of Massachusetts and across the country. “We are thrilled to receive this recognition for our exemplary workplace practices,” said Edward Shulkin, co-CEO of GiftCard Partners. “The commonality within GiftCard Partners is the shared vision of developing and maintaining a work-life balance. Employees are given the flexibility to create a schedule that works for them, the company, and in many cases, their families and still enable them to be active participants in team projects focused on individual and company goals,” states fellow co-CEO, Deborah Merkin. The award is the result of a rigorous assessment. Worksites must first qualify in the top 20% of the country based on a nationally representative sample of employers. Two-thirds of the evaluation of applicants comes from an employee survey. Applicants are evaluated on six research-based ingredients of an effective workplace: opportunities for learning; a culture of trust; work-life fit; supervisor support for work success; autonomy; and satisfaction with earnings, benefits and opportunities for advancement — all factors associated with employee health, well-being, and engagement. “These employers are making work work in innovative and inspiring ways and set an example for employers both nationally and internationally,” said Ellen Galinsky, president of Families and Work Institute. When Work Works is a national project that shares research results on what makes an effective and flexible workplace within the business community. eve@familiesandwork.org and phone number (212) 716-1842; or Kate Kennedy of SHRM at kate.kennedy@shrm.org and (703) 535-6260. Dedicated to growing our clients' B2B gift card business through the use of leading-edge marketing and technology platforms; we develop innovative approaches to the incentive, loyalty, promotion, and fundraising markets; GiftCard Partners is one of the nation's largest developers of corporate Gift Card programs. We are an award-winning leader in the fast-growing payments industry. GiftCard Partners works with a broad range of leading brand companies as an out-sourced program management solution. Our clients’ gift cards are placed in workplace safety programs, health and wellness programs, employee recognition, motivation and sales incentive programs, and customer rewards and loyalty programs. Some of our clients include CVS/pharmacy®, The Home Depot®, AutoZone®, The Cheesecake Factory, Boston Market, and more. Visit www.giftcardpartners.com to learn more. When Work Works is a national initiative, led by the partnership of the Families and Work Institute (FWI) and the Society for Human Resource Management (SHRM), to help businesses of all sizes and types become more successful by transforming the way they view and adopt effective and flexible workplaces. Visit www.whenworkworks.org and follow us on Twitter @WhenWorkWorks @FWINews and @SHRMPress, and join the workflex conversation on Facebook.com/FWINews.